Web Based Website Control Panel (CNC) - FutureQuest, Inc. Already have a FutureQuest full package? Go to your CNC. The CNC is a fully functional control panel exclusive to FutureQuest. You will not find another control panel like this one anywhere else on the Internet. The CNC was (and continues to be) developed by FutureQuest and only for FutureQuest. Custom designed to service the needs of each and every site owner with a full package on the FutureQuest network; the CNC empowers first-timers, as well as long-term gurus, with the ability to easily and efficiently manage the majority of their account requirements from one convenient location! This feature-rich control center is so advanced it's actually simple! With its powerful functionality, yet pleasant graphical interface, site owners are able to control many aspects of their accounts by simply clicking their way through tasks that could take hours to complete at the command line (longer if you are not skilled at the command line to begin with!). There is no need to contact FutureQuest when you require a new email account, password change, or site update! Via the CNC you have full control at your fingertips enabling you to make these types of updates (and more!) whenever you like instantly! FutureQuest knows how important time is to a web site owner and via the CNC we continue to add new features that enable the site owner to make changes and updates, on-demand. Time is a valuable commodity and convenience is a necessity in this high-tech, instant society, we are operating in. Now you can spend less time accomplishing more with the CNC! All full packages, on the FutureQuest servers, include this exclusive CNC within their accounts! It can be accessed at any time from just about any web browser using our domain name for secure access via SSL Encryption like this https://xdom.securecnc.net/CNC/ (xdom is replaced with your own domain xdom in URL format). Scroll down to see many of the features the CNC has to offer or click here to explore a live demo. When prompted, the username and password are both "cncdemo" (without the quotes). Notice: The live demo does not contain _all_ of the features and functionality of the CNC, however, it will provide a working view of the look and feel of the real CNC. With the File Manager, managing your files is easy. Never before has it been this easy to manipulate your files right on the server without having to learn how to use Telnet! The CNC File Manager gives you a direct connection to your files allowing you to add, remove, and update them in real time. You can view HTML files, CGI scripts, or any text based file, with optional syntax highlighting for HTML files and Perl scripts. You can also edit any text based file with the File Manager's integrated Text Editor. Additionally, you can view small (less than 64k) binary files in Hex mode. The File Manager lets you set file permissions with ease. With 2 clicks, you can chmod your files as needed, instantly. You may enter the mode manually (e.g. 755) or you may choose what permissions are assigned to whom using simple checkboxes. The File Manager makes simple updates even simpler! You can browse your PC for files and upload them to the server. It supports ASCII, Binary, and Automatic file uploads. Automatic lets the File Manager determine what mode the file should be uploaded in, determined by the file extension. You can also download a group of files, neatly packaged in either ZIP or GZIP format. You can password protect any directory in your web site with ease. No more learning how to use the htpasswd program, or learning how to create an .htaccess file - the File Manager does all the work for you! (For those who prefer performing these tasks manually the functionality is there as well). You can group users, and protect multiple directories with only a few clicks. With the CNC, you can add or remove POP3 mailboxes with one click. You will be able to set and/or change your password for each mailbox and view how many messages are sitting in each box. When you delete a POP mailbox, you are given the option to forward any mail that is sitting in that account to an email address of your choice. This prevents the accidental loss of messages when removing an account. Note that all POP3 mailboxes also function as IMAP mailboxes if you prefer an IMAP email client. With every full package, you are able to receive mail at Anything@YourDomain.tld. Some site owners may not want this feature, as such, the CNC enables you to disable/enable the Catch-All functionality as desired. You can choose to forward your Catch-All email alias to any address you like. Each account comes with Unlimited Email Aliases - this means that you can set up as many Aliases as you need and with the CNC it is a simple task to complete! An Alias Stack is a Forwarding Alias with multiple recipients. You may have an email address at your domain that forwards to as many as ten different addresses! Sometimes you have an email address you simply want to ignore. A BlackHole does just that - email sent to a BlackHole address is simply dropped. This is handy if you want to set up an Autoresponder, but do not wish to receive the mail sent to it. It is also great for blocking an address that receives only junk mail. The SpamAssassin filtering software is pre-installed on the server. Easily customize your preferences via the CNC. Maintain email whitelists and blacklists. Choose whether to bounce, delete, redirect or simply tag suspected spam. Point-n-click simple filters for further control over your email. 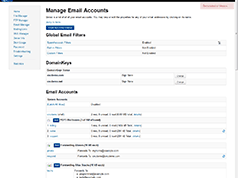 Filter email based on file-attachment extensions, message size, sender and more. You can quickly block common viruses and other unwanted emails before they ever reach your mailbox. Advanced users can set up custom scripts or shell commands to further process incoming mail. Each account comes with Unlimited Autoresponders. An Autoresponder is an email address that automatically sends a response to the sender of a message. You can optionally retrieve the emails that are sent into the Autoresponder, as well as including the original text in the automatic reply. Each account comes with the ezmlm Mailing List Manager preinstalled and ready for use. Via our exclusive web based interface, you may set up your mailing lists with ease. There is no need to learn how to interact with ezmlm through a command line interface, or learn tricky commands - the CNC does the work for you! With the CNC, you will be able to search your subscriber base, add or remove subscribers, send mail to the list, download the entire list, and much more. You can create Announcement (outgoing only) or Discussion lists. You can select whether or not users can subscribe on their own automatically, and whether or not to archive messages. 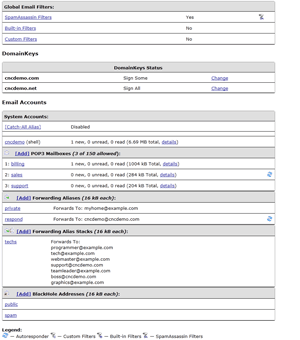 View Account Details such as: User/Host Names, Available Databases, & Disk Usage. 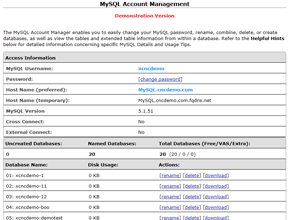 phpMyAdmin is a web-based tool that makes it easy to interact with your MySQL databases. At FutureQuest, phpMyAdmin is embedded into the server core for everyone to use; no need to install and maintain it yourself! Every full package FutureQuest offers includes extra FTP Accounts and the FTP Manager provides you with full real-time control over each them! With the FTP Manager, you can easily create extra FTP accounts, defining the directories the FTP users will have access to and assigning access permissions to those accounts. You can also edit (or delete) your extra FTP accounts with ease! 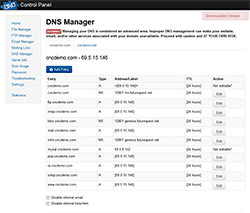 The DNS Manager allows you to manage the DNS settings for your FutureQuest hosted domains, including setting up and managing external MX records, DS-ERs, TXT, and SPF records! 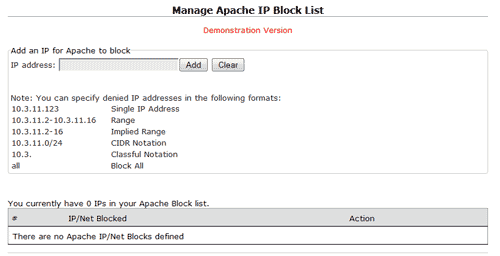 The Apache Global Block IP Manager (ApacheIPMgr) will allow you to manage a global deny list that will cover both non-SSL and SSL operations in unison. This should help out those that maintain large global block lists, and moves the management to the CNC instead of having to manually edit large lists in your 'xdom/.htaccess' or 'www/.htaccess' file. Never question how much disk space your web site is using! With the CNC Disk Usage module you will be able to see with one look exactly where your disk space utilization is at in detail. You will also see how much disk space you have purchased, and how much of that is still available to you. The CNC also displays a graphical breakdown for quick reference. You can see where your space is being utilized at a glance. FutureQuest offers a variety of ways to receive support including our widely known Community Support Forums, the always updated and searchable knowledge base, as well as 24/7 technical support but it gets even better than that! The CNC also contains a script troubleshooter. With just a click here and a click there, the CNC will look at your Perl scripts and try to point out any obvious errors that may be hard for a weary developer to find. The Troubleshooting section also contains a looking glass into your cgi_error and php_error logs. With one click, you will be able to view the last 100 lines of your error logs, which also try to pinpoint why errors may be happening. 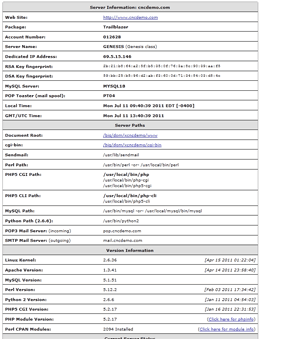 Additionally, the Troubleshooting section contains a POP server troubleshooter. If you are having trouble downloading your email, this tool will help you pinpoint where the problem lies. You can select many options that control how your CNC and even your web site behaves. You can choose to hide the Recent Folders list in the File Manager, and you can even control some more advanced features such as recursive deletion of directories and overwriting files on upload. Using http-analyze 2.2, your raw logfiles are turned into a comprehensive graphical summary report that is updated every 24 hours. You may view any hour, day, month, or year and find out how many times you web site has been loaded, by what types of browsers, from which links and search engines, and a whole lot more! Click Here for an example. Are You Ready For A FutureQuest?